A layer of graphene. Image: University of Manchester. In a paper published in Carbon, Aravind Vijayaraghavan and Maria Iliut from the University of Manchester in the UK have shown that adding a very small amount of graphene, the world's thinnest and strongest material, to rubber films can increase both their strength and elasticity by up to 50%. Thin rubber films are ubiquitous in daily life, used in everything from gloves to condoms. In their experiments, the scientists tested two kinds of rubbery materials: natural rubber, comprised of a material called polyisoprene; and the synthetic plastic polyurethane. To these, they added graphene of different kinds, amounts and sizes. 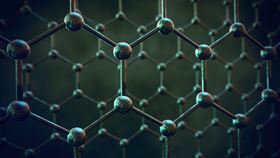 In most cases, they observed that the resulting composite material could be stretched to a greater degree and with greater force before it broke than the same materials without graphene. Indeed, adding just 0.1% of graphene was all it took to make the rubber 50% stronger. "A composite is a material which contains two parts, a matrix which is soft and light and a filler which is strong. Taken together, you get something which is both light and strong," says Vijayaraghavan, who leads the Nano-functional Materials Group at Manchester. "This is the principle behind carbon fiber composites used in sports cars, or Kevlar composites used in body armor. In this case, we have made a composite of rubber, which is soft and stretchy but fragile, with graphene and the resulting material is both stronger and stretchier." "We use a form of graphene called graphene oxide, which unlike graphene is stable as a dispersion in water," adds Iliut, a research associate in Vijayaraghavan's group. "The rubber materials are also in a form that is stable in water, allowing us to combine them before forming thin films with a process called dip molding. The important thing here is that because these films are so thin, we need a strengthening filler which is also very thin. Fortunately, graphene is both the thinnest and strongest material we know of." The project emerged from a call by the Bill & Melinda Gates Foundation to develop a more desirable condom. "Our thinking was that if we could make the rubber used in condoms stronger and stretchier, then you could use that to make even thinner condoms which would feel better without breaking," explains Vijayaraghavan. But this composite material could have many other applications in daily life as well. "Similar arguments can be made for using this material to make better gloves, sportswear, medical devices and so on," he says. "We are seeing considerable industrial interest in this area and we hope more companies will want to get involved in the commercial opportunities this research could create." This story is adapted from material from the University of Manchester, with editorial changes made by Materials Today. The views expressed in this article do not necessarily represent those of Elsevier. Link to original source.